When it comes to salads, does it get much prettier than a salad with ruby red pomegranate seeds in it? They instantly add gorgeous color and bright pops of juicy flavor to any salad. And they work especially well in this kale salad, adding the right amount of sweet-tart flavor. Add in some carrot ribbons for a little bit of crunch, some Israeli couscous for texture and a bold honey-lime vinaigrette and you’ve got one delicous salad that also happens to be really good for you. 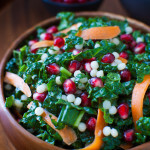 I’ll admit that when I served this pomegranate, Israeli couscous, carrot and kale salad with dinner the other night, my youngest daughter took one look, said “That looks way too healthy” and passed it on along. OK. So, kale salad isn’t for everyone but I think you’re missing out if you haven’t tried it at least once. I am determined to sell my kids on it before they leave for college. Some people find raw kale to be tough and bitter. However, there are several ways to ensure you have a tender and flavorful kale salad. First, I recommend using lacinato kale rather than curly kale. Lacinato kale is also referred to as Tuscan, dinosaur or Italian kale. It has long narrow leaves that I find are more tender than the leaves of curly kale, making lacinato kale my choice for raw salads. You should also remove the tough ribs from the center. I find it easiest to grab the stalk with one hand while pinching the leaves with my other hand and then tearing the leaves off along the stem. Finally, be sure to vigorously toss the leaves with the dressing. In fact, the best technique is to get your hands in there and really massage and rub the dressing into the leaves (I’m not kidding). This really helps soften the leaves. However, if you’re not wanting to get quite that close to your food (I’m right there with you), just rub the dressing into the leaves with a spoon as you are tossing. I often just use the same tablespoon I used to measure out all the ingredients for the dressing. The great thing about kale salads is that they keep really well even after they have been tossed with dressing. This means I can mix up a batch of salad one day and have it for lunch all week long … or pack it in my kids’ lunches. Just kidding, girls. Put all the dressing ingredients into a jar, screw on cap tightly, and shake vigorously until everything is incorporated. Or whisk all the dressing ingredients in a small bowl. Put chopped kale into a medium size bowl. Add 3-4 tablespoons of dressing and vigorously toss kale leaves with the dressing until leaves begin to soften slightly, 1-2 minutes. Let sit 5-10 minutes. Add couscous, pomegranate seeds, and carrots. Toss salad until evenly mixed. Add extra dressing as desired. When tossing the kale leaves, be sure to vigorously toss the leaves with the dressing in order to break down the fibers and make the kale more tender. Recipe for dressing adapted from The Yummy Life.